The Periyar University was established by the Act 45 of Government of Tamilnadu in 1997. The University is named after a renowned social reformer popularly called "Thanthai Periyar". The University thus established had its origin with the three departments (Commerce, Geology and Mathematics) of Postgraduate extension center of Madras University functioning at Salem at that time. The University Grants Commissions, New Delhi bestowed the 2f status on 09.10.1998 and 12(B) status on 17.05.2005 to the Periyar University. The university is certified accrediated with NAAC. "Wisdom maketh world" is the vision of Periyar University, as enshrined in the logo. This is based on the Philosophy of "Thanthai Periyar" in whose name the University has been established, that man becomes man only through acquiring knowledge. This vision aims at spreading knowledge and quality education far and wide. The mission of the University is to spread knowledge and skill in general and the thrust is particularly given to enable the knowledge reach the youth of economically, educationally and socially weaker sections. This mission is achieved through the Departments of study and research of the University and its affiliated Colleges.The future of the nation is in the hands of the youth to make this country self-reliant and self-sufficient and the youth has to be trained educationally. The enlightment of knowledge and quality education given to the youth will be helpful to achieve this target. In the direction of nation building process, this University aims to uplift the society through education to attain self-reliance. The University is situated on the Bangalore National Highways (NH - 47), 10kms from the Salem city and easily connected by road.The University campus extends to about 100 acres accommodating the administrative and department buildings. Periyar University, Salem has 102 affiliated Colleges. Click here to explore them. 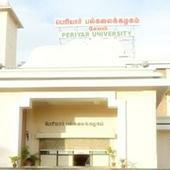 Periyar University, Salem has 27 Departments listed that offer various academic courses. Are you Interested in studying at Periyar University, Salem?